We have to go back. I know it in my heart. I remember listening to the ocean break against the rocky cliffs or gazing into azure waters that spilled white foam on the beach. While some luxuriated in a warm-water swim, snorkel or scuba dive, others rocked on sailing vessels of all types, yachts, touring vessels, and other sea-going transports. The Isle of Capri is a magical, lush paradise, if one exists on this earth. We arrived in the Marina Grande, cruising in on a high-speed catamaran. The wind whipped past your face with enough force to cause anyone’s eyes to tear up. Slowing in the harbor, the majestic mountains dotted with dazzling white-washed houses capped in orange or red tile graced the eyes. 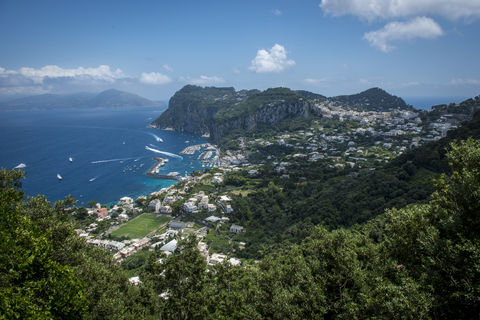 At the top of two of the mountains are the villages of Capri and Anacapri. We found the village of Marina Grande in the Bay of Capri fascinating, friendly, and inviting. However, the heights called me to a grander view. You can walk or ride to the closest mountaintop. If you’re fit and young, I recommend walking the road from the Marina to the center of Capri, enjoying the steep twists and turns. Our boys loved running ahead. If you need to ride, funicular train cars rise above the marina, laying out the island’s green expanse. Capri is nestled on the slopes of Monte Tiberio. When you arrive at the top, be sure to visit the end-point of the funicular train, which is Belvedere, or “little balcony,” from which you can see the stately harbor below. Wander into the Piazza Umberto I (The Piazetta), a lovely small plaza containing the Church of Santo Stefano, built in the Baroque style, contains many art treasures and sits upon the site of an ancient Cathedral. Taking the narrow lanes of the little town, you can visit shops, cafes, or go to see Villa Jovis, which is a settlement near Capri juts up from the eastern headland combines the beauty of an imperial villa, an enchanting view, and historical background that dates back to the Caesars of Rome, and even before into the antiquity of time and mythic legends. Tiberius lived the final ten years of his life (37-26 AD), staying most of the time in Villa Jovis. Take time to visit the Park of Augustus as we did, a picturesque location with many walking paths, varieties of flowers and plants, and many viewpoints of the water crashing into cliffs and on Faraglioni (small emerging islands). A pathway, called Via Krupp, is a paved pedestrian walkway that reminds one of a steep Le Mans race course cared out of the side of a cliff. Another fabulous sight is the Blue Grotto, on the northern side of the island, has a six foot wide entrance, but opens into a massive stone cavern with an arched roof. This tour must be taken by boat.